Kim Fee owns a fabulous, truly “delectable” business that provides meal delivery and catering in the Hutchinson, Kansas area. In the past her web presence was on Blogger, mainly focusing on recipe posts, but she always felt the need to go “beyond the blog” to emphasize her overall goal to prepare and provide great food for Hutchinson-area residents. When she contacted me, Kim wanted to continue the focus on recipes, while her husband wanted their meal delivery and catering services to be the focal point of the website. My challenge was to combine these two areas of emphasis into a unified website. In addition, Kim wanted to begin offering online orders (and eventually payments) on the new website. Here, my challenge was to find a simple way to provide this option without purchasing a bulky e-commerce tool that has many more features than necessary. 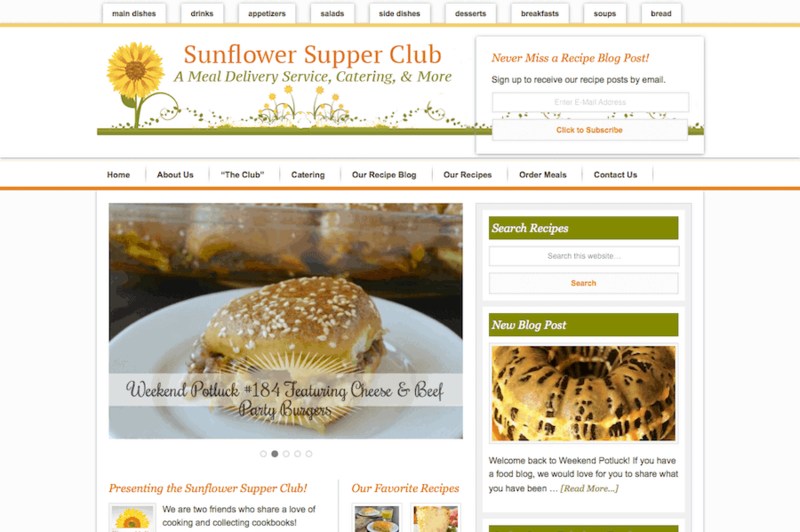 I think we achieved all of our goals with the website for the Sunflower Supper Club. Check it out, and if you live in the Hutchinson, Kansas area, read some recipes and even place an order for delicious food!